Spring is in the air? 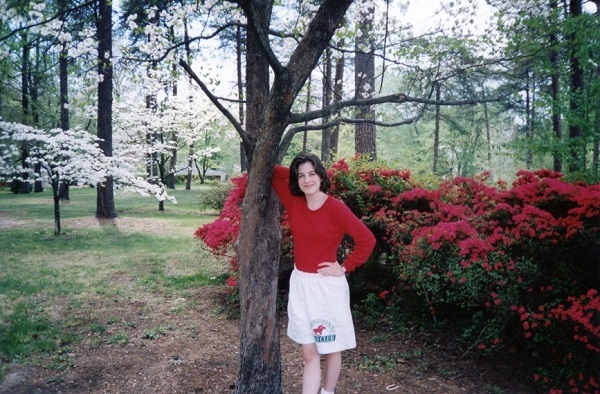 I’m rocking white shorts AND white legs, circa 1995. Fred and I don’t have what my uncle refers to as “the idiot box,” so navigating our throwback, tech-free Lenten discipline never included the elimination of the tube. Besides, cable was alive and well in the 90s, and unfortunately, is still kicking today. Last Saturday night, Fred and I volunteered for one of our favorite nonprofit’s annual event. Because we all worked until almost midnight, we were offered an overnight stay in the venue where the event was held. Our hotel room included a high definition TV mounted to the wall, the graphics of which always seem cartoonish to me. Since the launch of Saffron Cross in October 2013, Fred and I have traveled from Mississippi to Kentucky to Virginia and back, and at each hotel stop, we never turn on the TV. Even with a rare luxury in front of us, we forget it’s there. Now I remember why. Sunday morning we woke up our hotel room, determined to keep our Lenten practice but challenged with the unfamiliar environment. Outside, the electric blue hotel pool rippled, while snow kept its grip on lounge chairs. It was a sad, summer-as-nearly-forgotten-friend scene. “It looks kind of like sleet,” I stood at the window and said to Fred, remembering our friends had warned us last night of the impending wintry mix. I thought about checking my iPhone, but knew I couldn’t retrieve weather or road conditions, as I was committed to wireless free Sundays in Lent. “Let’s check the TV,” I said, looking for the power symbol on a remote with 75 buttons. Our local weather station buzzed with activity. 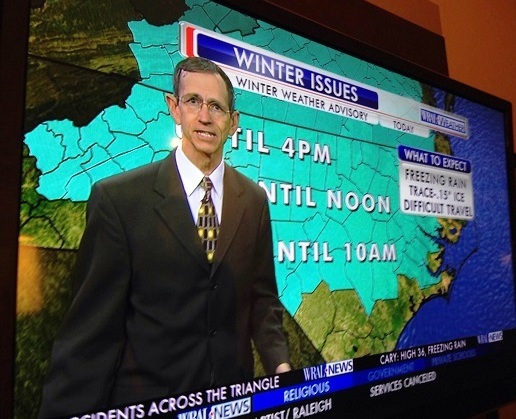 The “catastrophic winter issues” of last Sunday, courtesy of WRAL, our local CBS affiliate. The “disaster” on the TV screen was a 12-car wreck in which no one was seriously injured, but damaged cars littered the hillside. Hurried airport travelers had spun out on an exit ramp. I felt my blood pressure rise and I became frantic. It was compounded thinking, the kind of free-floating anxiety a woman grabs onto in anxious situations, moving from the threat of slipping on the ice to dying a painful death and orphaning her children. And, in the slowest moving closing advisory scroll I’d ever seen, as churches from A-Z announced the suspension of Sunday activities. At a five church per minute pace, I glued my eyes to the HD graphics for the next thirty minutes, heart racing as a looked for the “Bs” as in Binkley Church. 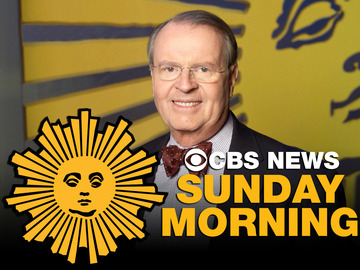 I endured commercials, a cut-away back to the car spin out at I-540, another interview with the tow truck driver who repeated his “slow down” mantra, statewide weather forecasts, and an advertisement for the subsequent Sunday programming hosted by an old man with a pastel bowtie. Minute after minute, the reel of sensationalized repeated itself: deadly roads! Arctic weather! Shows you must see! Products you must buy! I absorbed more upsetting news. I could have retrieved our church’s closure information in 10 seconds on my smart phone. A quick search, a swift traffic check for accidents, a pinpoint weather forecast as determined by our GPS location would have given me relief. Me, having separation anxiety from my iPhone. I even called the church. I’d worked myself into a tizzy: nail-biting seniors’ impending falls and broken bones from ice, the injustices of winter weather, and judging the drivers who thought driving 65 mph on a freezing highway was a good idea. My shoulders tensed and I looked like Richard Nixon’s twin-sister, gruff and intense, the weight of North Carolina’s Baptists, who needed monthly Sunday communion, on my proverbial plate. This is why we have no TV. 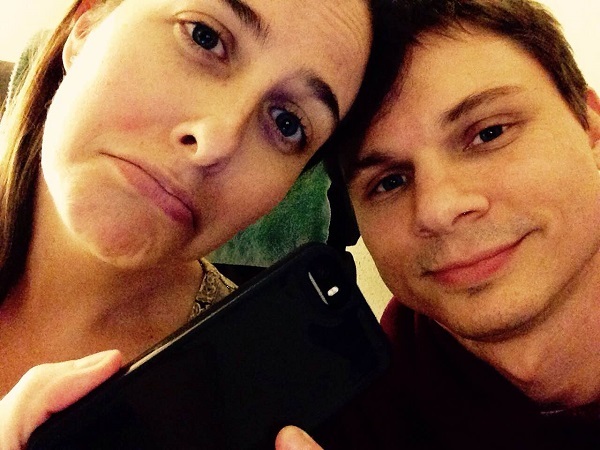 While my throwback Lent is a result of my resentment for 24-7 devices and my longing for a more spiritual life, this was a situation in which I wanted to worship my iPhone for its concierge services of zip-code weather, up-to-the minute accident reports, and hand-held email. I succumbed to the frustration that began with the TV. I turned on my wireless and scanned my inbox for an emergency email from the pastor or our Diaconate chair, reassuring me that church was cancelled, communion would be rescheduled, and no octogenarians would be harmed in the process. But, no such email existed. I broke sabbath for nothing. I turned the wireless back off, guilty and defeated. I had allowed 45 minutes to escape without reading my daily devotional and writing in my journal, two activities I promised myself I’d do each sabbath morning, no matter where I was or what I perceived that I “needed” to do. The lesson: everything is not an emergency. Jesus didn’t have cable, Internet, weather and traffic reports in the wilderness. Satan didn’t offer a two-hour delay in his temptations due to sleet and freezing rain. Nothing kept Christ from his spiritual practice. Nothing kept him from turning away from the world for a tech-free, aesthetic practice that prepared him for ministry—and ultimately, the cross. Amid the 24-7 demand for our attention, what might it mean for us to turn from the world, with its sensationalism, its instant gratification, in order to dwell with Christ? Nothing is more important than growing closer with God and one another. How’s your Lent going? Share your practices, discoveries, and challenges in the comments!